E. K. Barker , Charles Z. Bailey ,(1873-1954), Leopold Hugo (1866-1933), A.C. Pillsbury, (1870-1946), Louis S. Slevin, (1879-1945), Joseph K. Oliver, (1863-1942), Julian P. Graham, (1886-1963), Ted McKay (1903-1987), Wm. L. Morgan (1902-1967), Horace Lyon (1888-1976), Fred Harbick (1906-1974) and Edward H. Mitchell (1867-1932) and other California photographers and Monterey photographers. Was active on the central California Coast from Alameda, San Luis Obisbo, Santa Barbara and finally in Monterey. Arnold replaced C.W.J. Johnson as the official photographer at the Del Monte Hotel in 1902. And early photos of the 11th U.S. Cavalry at the Presidio of Monterey. Arnold was not only a talented photographer but was also a collector of other early California photographers negatives and images. R.J. Arnold died in Monterey on May 19 of 1929. Arnold was replaced by J. P. Graham as Hotel del Monte photographer in 1924. Holdings: over 2,300 Photos s from 4x5, 5x7, 5x8, 6½x8½ , 8x10 glass negatives and original prints and real-photo postcards. Was active from 1898, and some of his earliest views are of Fernside, the A. A. Cohen family estate in Alameda. E.A. Cohen traveled all over the state from Fort Ross in the Northern part to San Diego in the South, photographed Mt. Tamalpais, Yosemite and most of the California Missions. He was in San Francisco for the 1906 earthquake and documented the ruins of the city. He called Monterey County, the best place to photograph over any place I know. Cohen used a 5x7 Pony Premo No. 6, a folding field camera, to record his views, and often hand colored his prints. Many of E.A. Cohen's photos where made into postcards. His work appeared in Camera Craft Magazine, and many other publications. Corroll B. Clark came to California in 1875 with his family first to San Jose then to the Monterey area in 1895 he had a tintype gallery in a tent on Forest Avenue, he had studio's in a number of location in the Monterey, Pacific Grove area. He bought the studio of Miss. Preble in August of 1903 on Forest Avenue and sold it to Dan Freeman in 1905. To see an image by Clark of the Congressional Church fire of 1910 Pacific Grove and photos of Asilomar. For a time he had the Lovers Point studio just above the beach near 17th Street till 1932 when it was removed by the city. He also operated the Iris Theater in Pacific Grove. In 1920 he sold his studio to photographer M. E. White but bought it back in 1922. He is listed in the Polk's City directory at 225 Forest Avenue from 1926-1939 as a photographer he gave up photography in the late 1930's to run a bookshop at the same address he passed away at the age of 82. Holdings:over 300 images 5x7 and 6½x8½ glass negatives, original prints and real-photo postcards. L.S. (Louis Stanislas) Slevin was a native of California. He came to Carmel in 1903 and opened a shop on Ocean Avenue He photographed all around Monterey County from Big Sur to Salinas. He married his wife Mabel shortly after moving to Carmel. He left a rich visual history of the Carmel area in both postcards and 5x7 prints. Slevin and E.A. Cohen went out photographing together to Mission San Antonio in 1906 and around Carmel and Big Sur. Slevin photographed the whaling station at Moss Landing in 1919. To see a image by Slevin. He also photographed many of the Shipwrecks on the Monterey Bay area. They moved from Carmel to San Jose in early 1940's and Mabel E. died on January 8, of 1943 and He died on November 9, 1945 he was 67 years old. Holdings: over 456 images by L.S. Slevin 5x7 glass negatives, real-photo postcards and original prints, an ongoing collection. He was born in Tannwald, Bohemina. He immigrated with his family in July of 1879 when he was 3 years old they settled in Trenton, N. J., He enlisted in the U.S. Army at Trenton, New Jersey on Jan. 10, 1902 as a musician in the Fourteenth Cavalry. By 1903 we find him at Fort Clark, Texas. He was one of Montereys premier photographers, A.C. Heidrick is well remembered for his panoramic views and his school photos. He was active from 1907 to the early 1940's, and did all kinds of photographic work, from making real photo postcards to making long panoramic views around the Monterey Peninsula. Many of the images are of everyday life on the Peninsula and of the Army, the 11th Cavalry and the 76th Field Artillery at the Presidio of Monterey and also Camp Ord and Fort Ord. 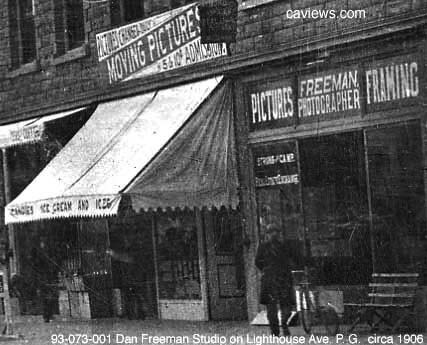 He had several photo studios in Monterey: one of the early ones, at 109 Lighthouse Avenue in New Monterey, It was lost in the oil fire of 1924. Later studios were located at 232 and still later at 482 Alvarado Street in Monterey. In the late 1930s he retired from active business and moved to San Diego County. Holdings: include over 611 views by A.C. Heidrick himself or by Heidrick & Heidrick Studios. He also worked with other local photographers J.P. Graham at the Hotel Del Monte and Rey J. Ruppel. A large part are gifts from the family. A small selection of some of our Heidrick Holdings. Daniel Freemen was born in New York city and came to the Monterey Peninsula in 1904. He got his start in photography in 1905 when the Coastal steam schooner Gipsy ran aground at McAbee Beach, when he sold postcards and made $ 300.00 in three days. Holdings: over 200 glass plates, negatives and prints and real-photo postcards. a gift from his daughter Elsie Parsons and her son Rolland E. Parsons. And came to California in July, 1896. After briefly trying pharmacy, then as a telegrapher on Alcatraz Island, He settled down at the turn of the century as a Los Angeles newspaperman. In 1902 he moved to San Francisco and worked as a reporter, then an editor, for the "News". He married Edith Alice Kinney in San Francisco on July 1, of 1904. Stellman was a protege of Arnold Genthe and produced a significant portfolio of photographs in San Francisco's Chinatown between 1906 and the early 1920's. He moved in 1947 with his wife Edith Kinney Stellmann (1877-1957) to Carmel on the Monterey Peninsula where he remained until his death in Carmel at the age of 84 years old on June 20, 1961. Holdings: Over 100 images of San Francisco Chinatown. He was born in San Diego and came to Carmel with his family in 1914. Holdings: 5x7 and 6½x8½ glass plates and film negatives, and original prints. to see more photos by Josselyn. We have over 3,800 images by Lewis Josselyn a gift from his widow. George Seideneck was born on February 4, 1885 in Chicago he came to Carmel in March of 1918. A artist, oil painter and photographer. He took what is the most seen image of Cannery Row and the Monterey Fishing in 1945 of California Packing Corporation plant 101 on Cannery Row. He also photographed Carmel and and the Hatton and Berta Ranchs in Carmel Valley and the Big Sur Coast. He was born in Aurora, Colorado in 1888 and in the early 1900's he had a photo studio in Wapato, Washington later moving to Lordsburg, California and still later settling in Pomona, Los Angeles Co. in 1920. His real photo postcards will often have his imprint on the front of the cards reads Frashers. Inc., Pomona, Calif. and on the back you will find a variety of backs one popular one was Frashers Foto Card. He was married and had a son Burton Frasher Jr. born on September 19, 1915. Holdings over 157 real-photo postcards and is an on going Frasher collection. Zan Stark was a postcard photographer and had his studio at 324 Miller Avenue in Mill Valley in Marin County, California. He was working from the 1920's into the early 1960's under the name Zan of Tamalpais. Zan photographed the California coast from Alameda, Belvedere, Big Sur, Bolinas, Carmel, Donner Lake, Fairfax, Lake Tahoe, Larkspur, Monterey, Monterey Co., Napa Co., San Anselmo, Santa Cruz Co., San Francisco, San Rafael, Sonoma County, Stinson Beach, Tiburon, the Redwood Highway and most of Northern California and also up in to Oregon and over into Nevada and Utah. He moved to Boyes Hot Springs, Sonoma around 1952 and died on March 17Th., 1967 in a Sonoma rest-home. Holdings: over 875 postcards and is an on going collection. We have a few of his original 5x7 film negatives. In the 1920s he worked for his parents Clyde H. and Hattie Morgan of Peninsula Printing Co.
Mr. Morgan served in the Air Force in World War II from July, 1942, until February, 1945. From 1955, he had devoted full time to free lance photography. Morgan made copies of early Monterey photographers works putting his name on the prints he made from copy negatives. Holdings: over 855, images and is an ongoing collection a gift from Albert E. Plapp and others 4x5 film negatives and 4x5, 8x10 prints. A small selection of some of our Morgan holdings. Views of Cannery Row and Monterey fishing industry He was the personnel supervisor for California Packing Corporation plant 101 on Cannery Row, Monterey in 1946-1962 also views of Carmel and Carmel Valley. When plant 101 closed he moved to San Jose returning to Monterey in 1972. Holdings: over 259 2x2, 4"x5" film negatives and prints a gift from the photographer and from his widow. A collection of 4x5 and 5x7 negative of aerial views of Monterey, Cannery Row, Carmel and Big Sur in the late 1930's. Ted and his brother John had Mckay's Camera shop on Alvarado Street in Monterey. Ted did a wonderful job of documenting the Monterey area with his 5x7 aerial camera. Holdings: 77 5x7 negatives a gift from the photographer Ted McKay and his son Peter McKay. A small selection of Ted Mckay photos. Carl came to Monterey in 1940 from Seattle. He opened Mission Photo Service in the Hotel San Carlos and was their from 1940 to till it closed in 1983 and removed to make way for a new hotel. At age 92 he was not ready to quit working. And in 1988 Carl and Mission photo joined California Views and Pat Hathaway at 763 Lighthouse Avenue, New Monterey. Holdings: over 150 images including 4x5 & 8x10 film negatives and prints and real-photo postcards. A small selection of some of Jones photos. Don and his wife Lillian ran Woodward Marine company that was in business for over 50 years in Moss Landing. Holdings: Over 200 4x5 film negatives and 8x10 prints of fishing boats a gift from his son. A small selection of some of Woodwards images. Prints are available from 11x14" to 40x60" inches. California Views Historical Photo Collection.